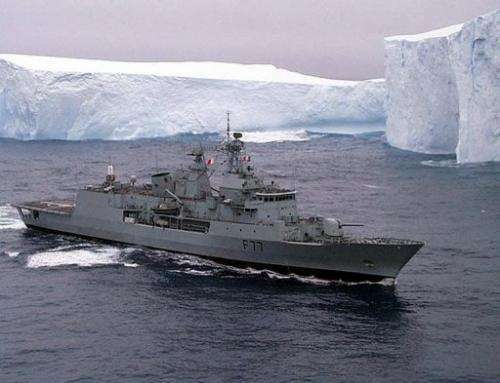 File photo shows a New Zealand frigate patrolling for pirate toothfishing boats at the Ross Ice Shelf in Antarctica's Ross Sea in 1999. A coalition of environment groups called Tuesday for the world's largest marine reserve to be declared in Antarctica's Ross Sea to prevent "industrial scale" fishing ruining the pristine ecosystem. A coalition of environment groups called Tuesday for the world's largest marine reserve to be declared in Antarctica's Ross Sea to prevent "industrial scale" fishing ruining the pristine ecosystem. The Antarctic Ocean Alliance said waters surrounding the remote frozen continent were facing increased exploitation as fish stocks elsewhere in the world continue to decline. The alliance of 16 conservation groups including Greenpeace, the World Wildlife Fund and Humane Society International, proposes a 3.6 million square kilometres (1.4 million square mile) protection zone in the Ross Sea. "The Ross Sea is one of the world's most amazing and relatively untouched marine environments," the alliance's US adviser Chuck Fox said at the launch of a report outlining the proposal in Wellington. Fox said that while New Zealand and the United States had also outlined plans to protect the Ross Sea, their proposals did not go far enough and would not prevent commercial fishing in the area. He said the international organisation charged with managing the southern seas -- the Convention on the Conservation of Antarctic Marine Living Resources (CCAMLR) -- was set to decide on a network of marine reserves this year. 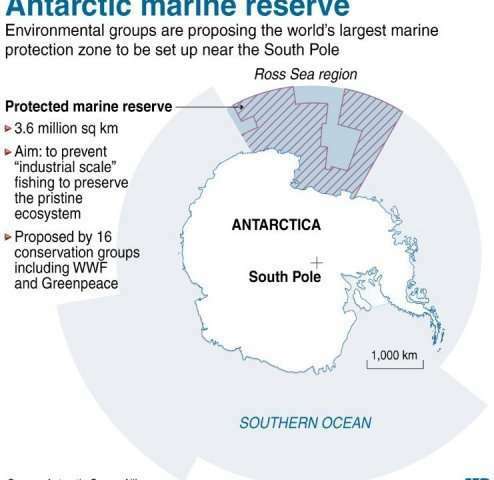 Map showing a proposed 3.6 square kilometre marine reserve in Antarctica's Ross Sea region being pushed for by an international coalition of 16 conservation groups. But Fox said CCAMLR was making its decision behind closed doors and the alliance was launching a world-wide petition titled "Join the Watch" demanding the best-possible protection for the Ross Sea. The petition has attracted high-profile supporters including British tycoon Richard Branson and Hollywood actor Edward Norton, who said it was vital for the public to lobby CCAMLR as it decides the Ross Sea's fate. "There's a moment of opportunity here to apply pressure and send a signal that millions of people are watching this process and are saying 'don't let us down'," he said. The report said the Ross Sea was home to large numbers of seal, seabirds, whales and squid, as well as the Antarctic toothfish, a slow-growing species which lives up to 50 years and has been decimated by fishing in recent years. It said Antarctica was also a critical resource for studying climate change, with its ice cores providing valuable data on greenhouse gas levels and temperatures. "A large-scale (Ross Sea) marine reserve would be an important and inspirational step for marine protection both in the Southern Ocean and globally," it said.